Hannah Johnson hits her first home run of the year for the Lions as they win game two 16-3. 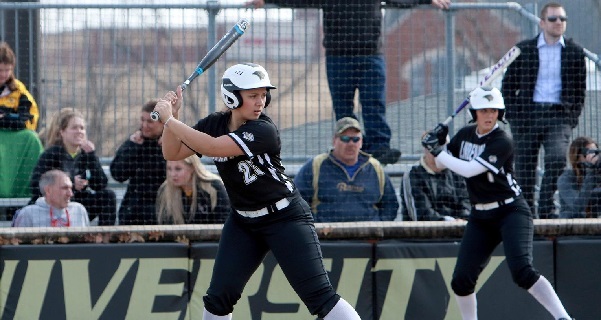 Lindenwood softball scored 26 combined runs in a doubleheader sweep of Missouri S&T over the weekend. As a team, the Lions hit .533 with a .767 slugging percentage and a .567 on-base percentage. Lindenwood had three doubles, a triple and three home runs over the 11 innings played. The Lions are now 16-10 overall this season. In game one Austine Pauley opened the scoring in the second inning with a solo home run. She also ended the game with a two-run home run. Overall, Pauley was 4-4 with four RBIs and a double shy of the cycle. Hannah Porter was 2-2 with a double and a run scored. Courtney Klosnowski was 2-4 with a run scored and an RBI. Ceairra Perez was 2-3 with two RBI in the contest. In the circle, Marina Esparza picked up the victory in relief, throwing 3.1 innings pitched with one earned run and two strikeouts. The Lions’ offense ramped up in the first inning of game two, plating 11 runs in the opening frame. Lindenwood scored 11 runs on 10 hits and 16 total batters came to the plate for the Lions. Hannah Johnson hit her first home run of the season in the first, a three-run shot to left. She finished 2-2 with a run scored and four RBIs in the game. Stormee Galka hit lead off, going 3-4 with three runs scored and an RBI. Riley Luetkenhaus came off the bench to go 3-3 with two runs scored and two RBIs. Klosinski was 3-3 with two runs and three RBIs in game two. Sam Dean was 1-2 with a double, a run scored and an RBI. The Lions 16 runs scored are the most for a Lindenwood team since plating 17 last year, a feat the Lions achieved twice that season (most recently at Pittsburgh State on Apr. 13, 2018, a 17-10 win). The Lindenwood NCAA Record for runs in a game is 18 runs, scored on March 19, 2016, at Fort Hays State. Galka threw all five innings in the circle, allowing two earned runs and striking out three. The Lions take on Missouri Western and Northwest Missouri in MIAA doubleheaders this weekend. Lindenwood travels to St. Joseph, Missouri, on Friday and Maryville, Missouri, on Saturday. The Lindenwood billiards team ended the fall semester with a 10-2 record despite sophomore Brandon Vanoverbeke being benched one semester because of academic ineligibility. The semester is closing out and the gates are open for Vanoverbeke, but how much better can things get?